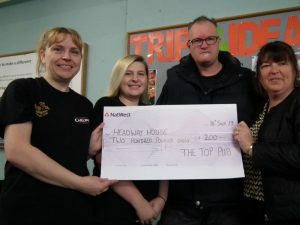 Angela Docksey, Landlady of the Top Pub Brown Edge together with Katie Richards, and Reece Davies recently Donated a cheque £200 to Headway House, North Staffordshire. This money was raised by the Top Pub by having a Charity Fun Day. The Top Pub staff would like to thank everyone for their support for this event. On behalf of members ,staff and Trustees, at Headway we are truly grateful for this generous donation. The cheque was presented to Michelle Gunnery ( pictured right) who is one of our Trustees.